Familiar with the Huawei SnapTo? Think of it like a Moto E competitor, only it has slightly better specs like a 5-inch HD display and 5MP camera with flash. 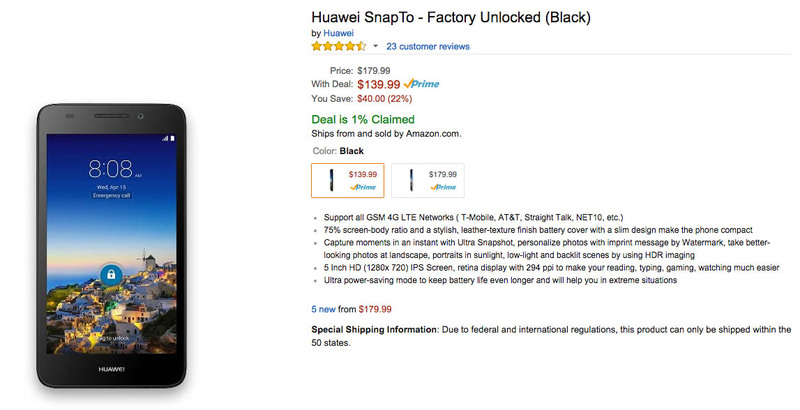 For the next 3+ hours, you can buy one on Amazon for the discounted price of $139.99. That’s a good $40 off on a phone that not only has an HD display, but 4G LTE connectivity on T-Mobile and AT&T, quad-core Snapdragon 400 processor, 8GB internal storage (with SD card slot), and 2MP front camera. If you are in need of a replacement phone, a starter phone, or just like discounted smartphones, hurry on over.